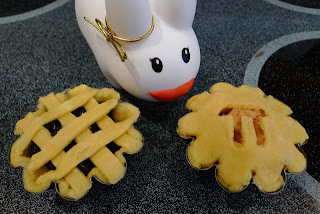 Year of the Labbit: 3.14 HAPPY PI DAY! Clover needs to work on her pie top weaving skills! There's no better way to celebrate 3.14 (AKA Pi Day) than with the kind of pie you can eat. Now if only there was infinite pie. Yum. 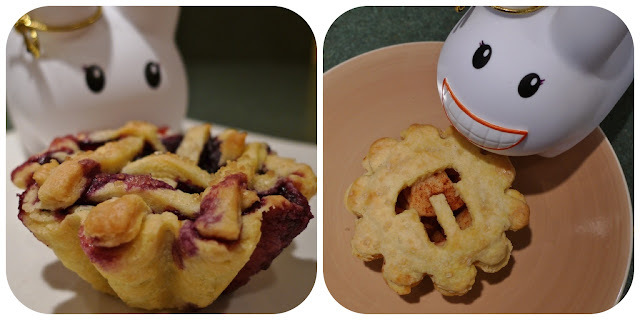 So what do you do when you have a jonesing for pie but you don't want to bake a whole pie? Or maybe you're a solo labbit and just want a single serving. 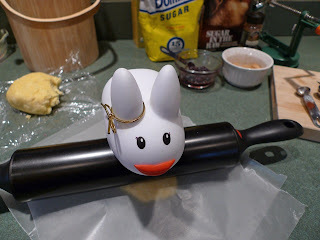 Well, the solution is to make some pie dough and freeze it so there's always some on hand. 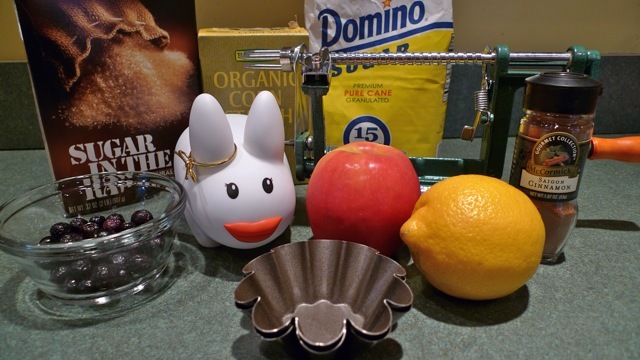 Making pie crust is ridiculously simple, and the following pie crust recipe is a labbit favorite. It's been used on mini cream pies and egg tarts and it's buttery, flaky, and so, so, tasty. As for the filling, you've probably got a handful of berries or an apple, so all you need is a bit of lemon juice and pantry staples and snap, you've got yourself your very own single serving pie. 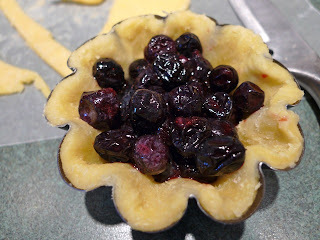 Click here for a printable pie crust recipe, and click here for a printable recipe for the fillings. Happy Pi Day! Preheat oven to 425°F. 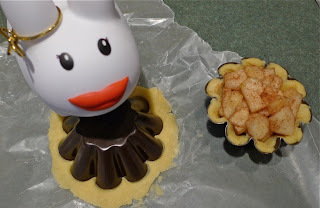 Roll out a portion of pre-made pie dough to 1/8" thickness. Press into a mini pie dish or a 4" brioche pan. Poke some holes in the bottom of the dough with a fork. Reserve excess dough for the top. 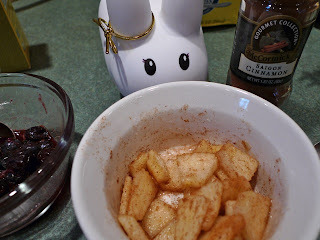 Toss the blueberries with the sugar and sprinkle on ground cinnamon (Clover likes lots of cinnamon). In a small dish, add lemon juice to cornstarch and mix well. Add to the blueberries and stir to mix. Preheat oven to 425°F. Roll out a portion of pre-made pie dough to 1/8" thickness. 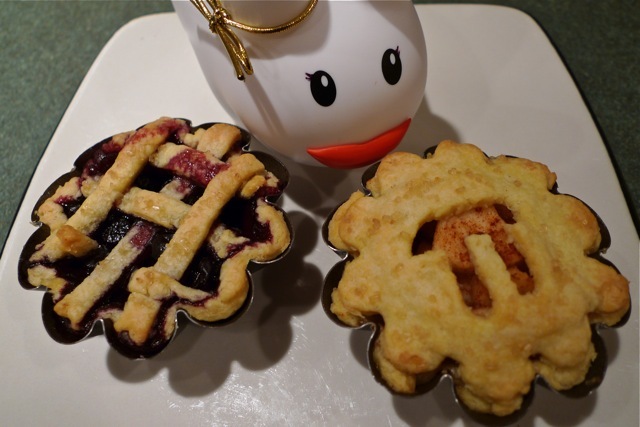 Press into a mini pie dish or a 4" broiche pan. Poke some holes in the bottom of the dough with a fork. Reserve excess dough for the top. 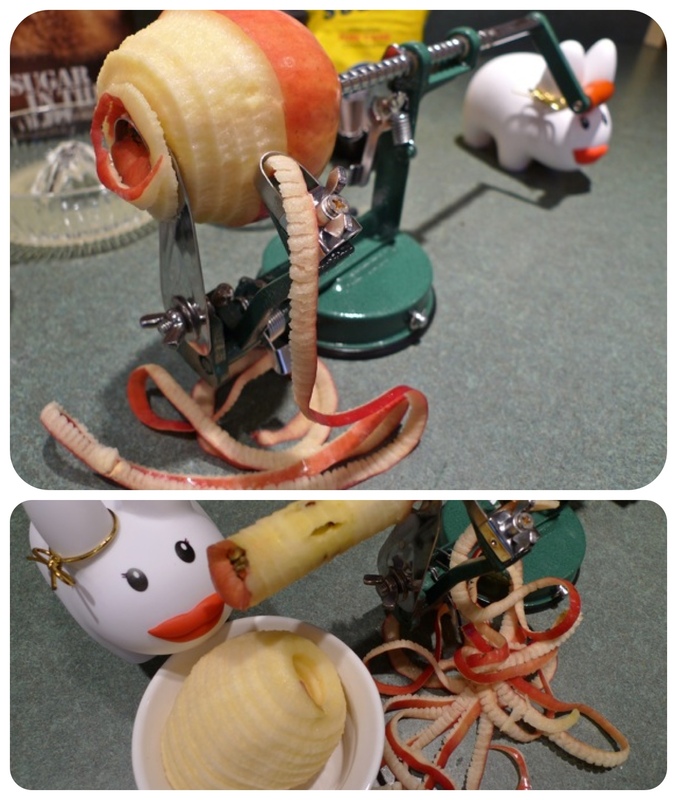 Clover loves to play with her apple peeler/corer/slicer contraption which is overkill for one pie, but what the hey, it's Pi Day! Give your apple a spin, then set aside enough for your one pie. 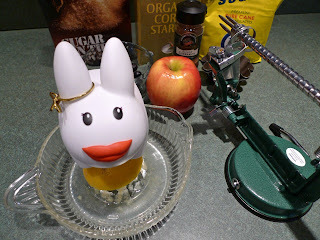 Toss the apple pieces in lemon juice and sugar. Give the apples a generous sprinkling of ground cinnamon and mix well. Pour apples into pie mold. With excess dough, create a weave pattern or a flat top with a few holes cut into the crust to allow steam to escape. Clover decided to celebrate with a little pi symbol cut-out. Sprinkle the top crust with some Turbinado sugar. Bake at 425°F for 20 - 25 minutes, until the crust is golden brown. Allow to cool before serving. Throw on some whip cream or some vanilla ice cream and enjoy! Hi! Im making a blog... and..... I'm not very good at it!!!! The different pages such as home, meet the labbits, labbit friends, exc. I can't figure out how to make another page! I only have the home page, and I don't know what to do!! Can you help me? With blogger, there is a "pages" function where you can create I believe up to 4 different pages, separate from the blog roll. You can name them whatever you like (I chose "Meet the Labbits", "Labbit Friends" myself) and they can be about whatever you like. Your blog is your own, so make it unique! Who says you need pages? Who says you need all 4? There's lots of options, so explore! I don't know much about creating, I just fool around with all the options until I get what I like!